The Circus Maximus (in Italian Circo Massimo) is the biggest racetrack of ancient Rome, situated on the left bank of the Tiber River, between the Palatine and Aventine hills, near the center of the modern city. The name of Circo Massimo comes from the Latin Circus Maximus. One of the meanings of the word “circus” is a hippodrome, a place for horse contests. Horse racing has been taking place for centuries in the valley between the hills. However, the initial function of the racetrack was to host the Roman Games (Ludi Romani) that were part of a bigger festival honoring Jupiter. The first events were held in Rome in 500 BC, during the rule of Lucius Tarquinius Priscus. Quadrigas – chariots drawn by four horses abreast – competed in a straight-line race. Having reached the end of the valley, they turned around and were galloping at full speed back, trying to cross the finish line first. The rules have been changed in the 2nd century BC due to the construction of watercourse in Rome about 146 BC. To build it, they dug a tunnel 4,5 meters high of 2,5 meters wide (14 ft 9 in x 8 ft 2 in ) on the level ground of the valley. Along the whole hippodrome, one hill was left untouched, so that quadrigas could race in circles. This fact fully explains the second meaning of the Latin word “circus” – a circle, and then an Italian word “circo” – “circus” – appeared. The circus really was “massimo” – large, having a size of the entire valley, 600 meters long and 150 meters wide (2000 ft x 500 ft). Descriptions of the circus vary depending on the period of its development. At first, people who wanted to watch the horse racing, set directly on the slopes of the hill. With time, first buildings appeared: benches for the most respected and wealthy citizens, a wooden launch and stalls for horses. In its heyday, when first Roman emperors ruled, the Circus was one of the most impressive constructions in Rome. In the 1st century BC, Gaius Julius Caesar rebuilt it, having expanded and extended the arena and having dug the channel around it. Now, due to the new dimensions (621 m (2,037 ft) length and 118 m (387 ft) width! ), it could hold 12 quadrigas at the same time. They erected a fence around the stadium, built wooden stands for the patricians and seating tiers for plebeians. The Circus could accommodate 150,000 spectators and during next centuries the number has been more than doubled. At least, as many fans were supporting their favourites standing upright. At the one end of the arena, there were three towers: central one had the gateway for entry, the other two were completed with stalls for horses (standing cells) in a semicircle. Winners were leaving the circus through the gate on the opposite side. Along the arena, in the middle, there was a narrow platform, decorated with two ancient Egyptian obelisks. Both obelisks survived and can be found at Piazza del Popolo (a large urban square in Rome known as “People’s Square”) and at Piazza San Giovanni in Laterano in front of the Lateran Palace. On its both sides, the platform was completed with conical stone pillars – metae. Chariot racing started from one of metae and ended at the opposite end of the arena in seven laps. To count the number of laps, there were two stands on the platform with seven wooden eggs placed on each. After some time, a number of small fountains in the form of bronze dolphins – sea horses of a patron of horse-racing Neptunus – were added. After Caesar’s reign, the Circus Maximus attracted the inhabitants of ancient Rome about 500 years more. The end of its glory seemed to be far away. Many emperors who ruled in Rome, contributed to the decoration of the circus. 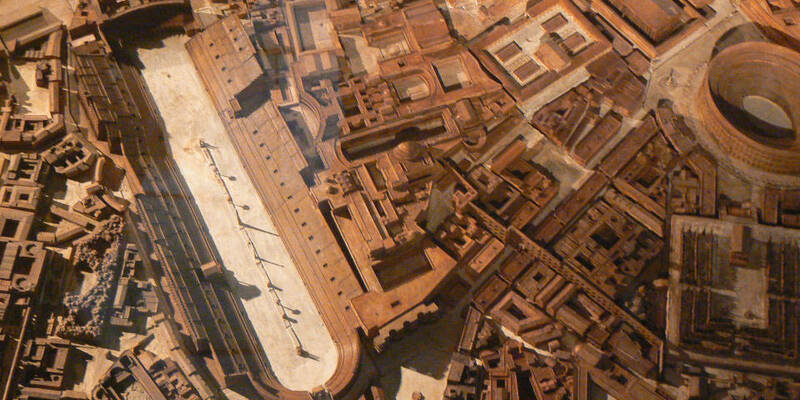 Thus, after a fire in Rome in 31 BC, Emperor Augustus restored the circus and gave it its final shape. Stone, stage-shaped stands for privileged spectators – senators and horsemen – became the foundation. Two upper tiers remained wooden, arcades with shops and taverns appeared outside. Decorating continued after Augustus: Emperor Claudius made standing cells marble and metae – gold, under the Emperor Nero’s order the channel was filled up to expand the arena. 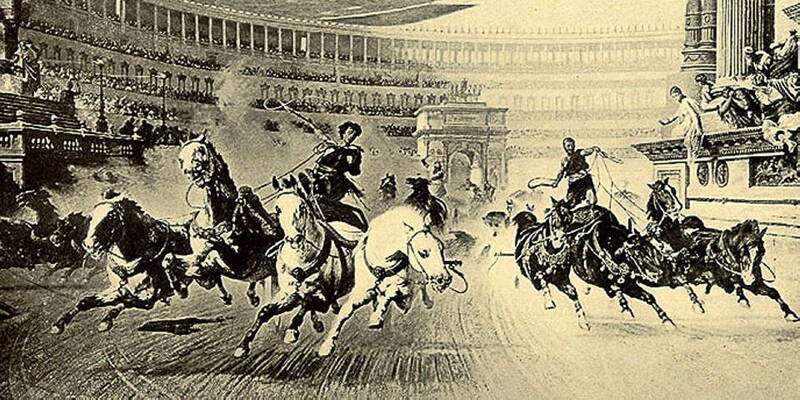 The last race in the Circus Maximus was held in 549 AD, during the reign of Emperor Totila. After this one, the era of destruction began. Romans took stones from ancient structures for the construction of new buildings; the remains were covered with soil. In the 19th century, archaeologists, before the construction of the gas plant here, found lower tiers of the circus at a depth of 6 meters (19 ft 8 in). 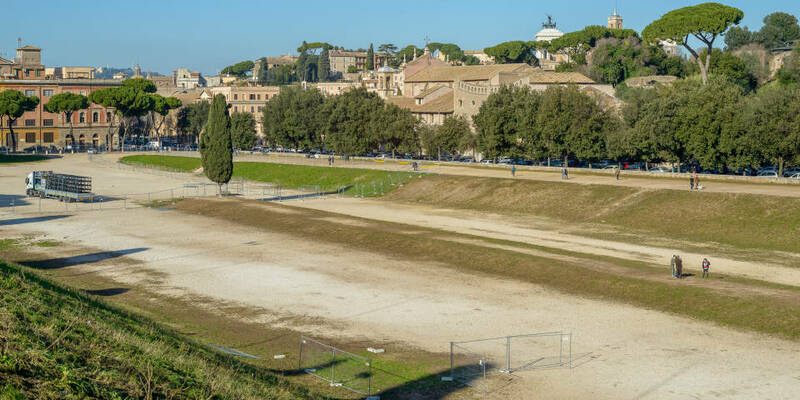 Today, you can find in Rome a vast oval meadow in the Circus Maximus’ place. The size of remaining ruins – parts of the track, marble standing cells and stone stands – impresses our contemporaries. A recreation area, very important for the city, is situated here. It is often used for mass festivities, military hardware parades, concerts and Rome’s birthday celebrations. 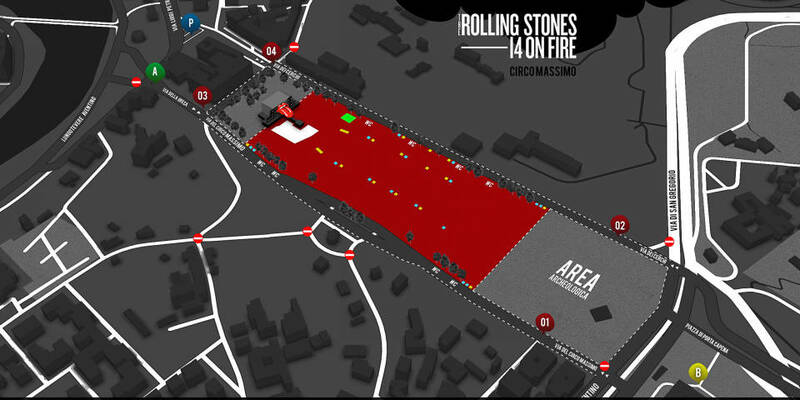 Thus, on June 22nd, 2014 the only concert of the legendary music band Rolling Stones in Italy during the world tour, which brought together 65,000 rock fans, was held here. Ancient Roman believed that the events of the legend of the Sabine women, which has become one of the favorite subjects of the world culture, took place here, in the valley of the Circus Maximus. During the reign of Romulus, the whole Rome was located on the Palatine and was so strong that could subjugate all around. Unfortunately, there were no women in the city, only soldiers, which couldn’t found families. The Romans negotiated unsuccessfully with neighbors, so the cunning Romulus invited them to celebrate a festival of Neptune Equester in a large valley at the foot of the Palatine. Sabines also came, with their wives and children. 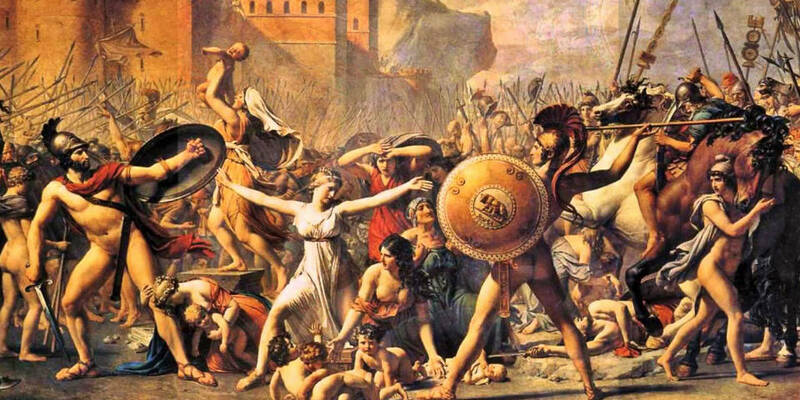 In the midst of the celebration, Romans grabbed the Sabine women. 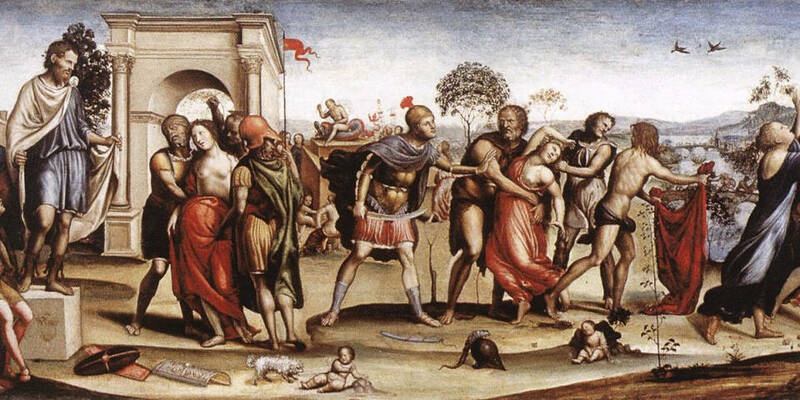 Their husbands and brothers could not stand the insult and soon laid siege to Rome, but the same women, who were the bone of contention, were able to reconcile the men. Thus, the unification of disparate fortified settlements on the seven hills into an ancient and eternal city began.